Oh digital Art. Digital and traditional art are very different in that with digital you really have to learn your tools to make them do what you want them to do. In real life you just change the way you’re holding it in a flash or something else. The point is that transitioning into the digital artworld is very difficult for me, someone who comes from a purely traditional background. Here is my first attempt at digital artwork in photoshop. 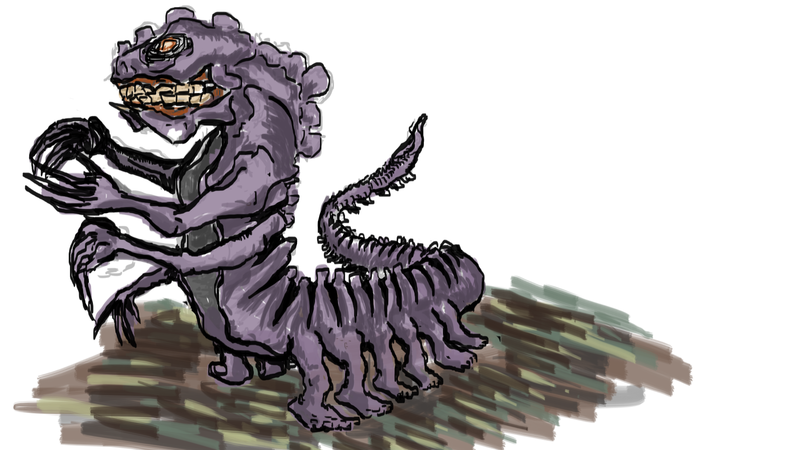 Its a spine centipede monster that I felt was a good reason to pull out the digital tablet. I will begin to enhance my skills in digital art as my studio, Archaic Gear, is creating a videogame at the moment. This isn’t for anything particular, but whenever we are ready to begin posting concept art for our game this will definitely be a place to check it all out so stay tuned! If you work in digital art, what was the most important thing you learned when transitioning over to digital format? Previous Post Buying from me Locally! Next Post PRESS START: First Look at upcoming Mexican Fantasy Videogame Comic!